Here is a sample rundown of a workshop for Public Bible Reading. Question: What bad experiences have you had with Bible readings at church? Question: What good experiences have you had with Bible readings at church? the sermon was easy to listen to because the congregation had understood the passage in the reading. The Bible Reading is certainly the most neglected aspect of our church meetings. Our readers may receive no guidance, no training, and (sometimes) no warning as we ask them to do the reading 5 minutes before the service starts. We as the congregation don't expect to be spiritually nourished by the Bible reading and neither does the reader. It functions simply as a necessary introduction to the sermon. The good news is however, this means that with little effort, our Bible readings can be vastly better and greatly add to people's experience of God's Word. Not only is there less work to do in the sermon after a good reading, the preacher can focus on bringing home the application of the passage to a people already impacted by God's Word. It's the low-hanging fruit of improving our church meetings. I’ve got here 3 central elements to make our Bible readings better. 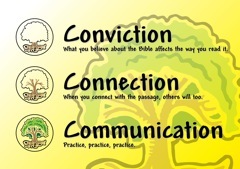 Conviction - What you believe about the Bible affects the way you read it. If I have time, I briefly mention the 'Brief History of Public Bible Reading' through pointing out posters of Bible characters with quotes (see my previous blog post for more information). Question: What are some true things we can say about the Bible? They stand apart from human words and ideologies which are false, lies and lead enslavement. By reading them we are speaking truth to our congregation that is liberating and life changing. Examples: John 8:31-32 - Jesus' words are truth which set us free. Proverbs 30:5: "Every word of God proves true"
They always achieve their purpose. God will use them for his glory as He has me speak them to His people. Isaiah 55:10-11 - "my word... shall not return to me empty, but it shall accomplish that which I purpose, and shall succeed in the thing for which I sent it." 2 Timothy 3:16-17 - All Scripture is breathed out by God and profitable for teaching, for reproof, for correction, and for training in righteousness, that the man of God may be competent, equipped for every good work. The Bible is written by human authors as well as by God’s Spirit. The Spirit will be working in people's hearts as God's words are read. 2 Peter 1:19-21 - "...men spoke from God as they were carried along by the Holy Spirit." The Bible is an ancient document, yet is living and active and through it God will still address directly the people in my congregation. Romans 15:4 - "For whatever was written in former days was written for our(B) instruction, that through endurance and through the encouragement of the Scriptures we might have hope. God's words are (generally) address to communities. Reading out the Bible to congregations of believers is exactly how the Bible was designed to be used. When read in public, the Bible is in its natural element. 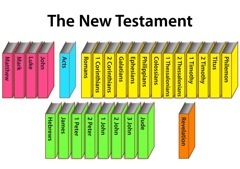 To illustrate this point, I have a laminated poster with all the names of the New Testament books on it. I then ask the group to circle all the books which were addressed to communities rather than individuals. The point is then self-evident. I am speaking the true and powerful words of God. Through them, God will speak to this audience. 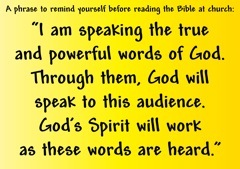 God’s Spirit will work as these words are heard. As well as having conviction about the Scriptures in general, we must have conviction about the passage you are reading in particular. We must first understand the passage otherwise we will communicate our misunderstanding. Break it up into sections and give each section a name. What is the Big Idea of the whole passage. How does each section contribute to this Big Idea? I ask people to shut their eyes and imagine as if they were members of the Ephesian church in the first century and Paul had written this letter directly to them. Then the partner reads the words to them and they write down on the side of the page the things the passage made them feel. Imagine what would be different in your life if you truly took to heart what was written in this passage. Imagine what would different about your church if everyone took to heart what as written in this passage. Can you imagine someone whose life could be changed by what is written here. People then pray together for these life-changing words in their pairs and after this we have a short break. From this point on in the workshop, nobody is aloud to read the passage silently in their heads. Again this part of the workshop is divided into 3 exercises. People gauge how to understand a speaker, not merely by the words but also how they are said (arguably even more the latter). By emphasising the right words we can greatly help people to follow the original author's thought but by make poor choices by emphasising words in an unhelpful way, we may obscure, confuse or even change the meaning. We work out which word to emphasise from the meaning of the passage. Exercise: Go through the passage saying each sentence aloud and then pausing to underline which words that should be emphasised in that sentence. There are three things we may vary with our voice: Volume, Pitch and Pace. In each reading there may be parts which work well in one or a combination of these. Mark them down on the text. NB. If we don't have time, people only do the first 3. Question: Why did Paul write letters? Part of the answer is that it was because he couldn't be there in person. He intended it to be read aloud to the congregation to say what he wanted to say. The writing of the letter is half the communication. Reading is is the second half. When we read the passage - we need to give respect to the original author. How would he have said these words if he could? What did he want to achieve with these words? Did he want to encourage them? If so, then he hoped that as they heard the words that they were encouraged. Therefore it’s your job as the reader to encourage the people with those words. Did Paul want to give them a warning. Then it’s your job to warn them. Think of what you think Paul is wanting to do in this passage of Ephesians and write it on the top of the sheet. Find a person in the room and read it to them to achieve what Paul wanted you to achieve. At the end - ask them to guess what you’d written down. The final part of the 'Communication' element of the workshop is to go through the tips for Bible reading from this post. Now people are given time (at least 5-10 minutes) to prepare the reading of the passage aloud and we finish by having someone read theirs to the group. It's very important that workshop participants are able to use the skills they worked on from the workshop in the next month or two after the session otherwise what they have learned will be forgotten.